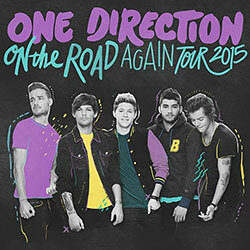 One Direction will perform two massive gigs at the Millennium Stadium on Friday 5th and Saturday 6th June 2015. The two performances at Cardiff's Millennium Stadium will precede a full UK tour by the chart-topping boy band later in 2015. One Direction released their fourth studio album, Four, in November 2014 and it topped charts across the world – confirming their status as the world's biggest pop act. McBusted will support One Direction at both of their Millennium Stadium shows.